Preheat the oven to 325. Heat the olive oil in a large enameled cast-iron casserole. Season the venison shanks with salt and pepper and pan sear over moderate heat until browned on both sides, about 6-8 minutes per side. Transfer the shanks to a plate and cover loosely with foil. Add the carrots, onion, celery and garlic to the casserole. Reduce the heat to moderately low and cook, stirring, until tender, about 7 minutes. Add the wine and cook, scraping up any browned bits, until slightly reduced, about 5 minutes. Add the tomatoes and chicken stock and bring to a simmer over high heat. Return the shanks to the casserole, making sure to center them in the middle of the vegetables, and add any accumulated juices from the plate. Cover the casserole and braise the shanks in the oven for 1 hour. 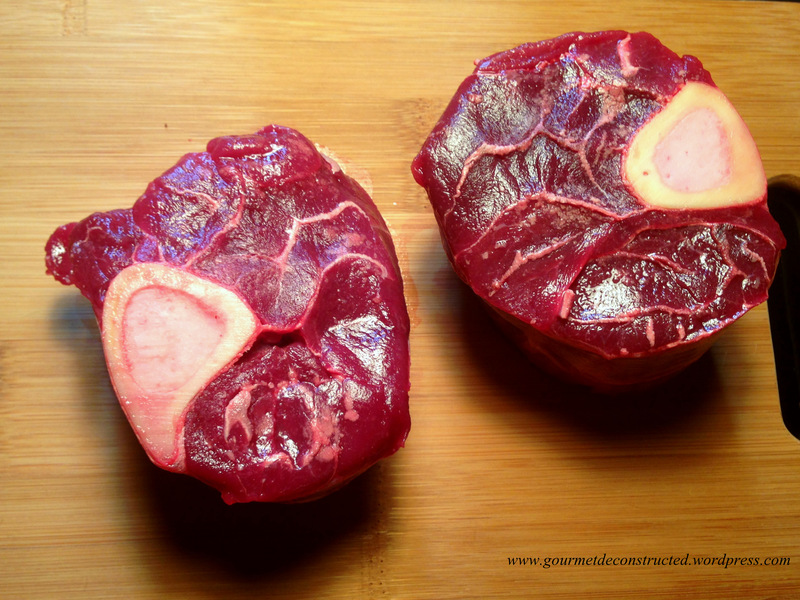 Turn the shanks, cover and cook for about 1 hour longer, until the meat is very tender. Transfer the shanks to a plate and cover. If necessary, reduce the sauce over high heat. Season with salt and pepper. Cut the strings off the shanks. Spoon the sauce on top and serve with your side of choice and a glass of full bodied red wine. Bon Appetit! I am an ex-construction worker turned chef/cookbook author from NYC that will educate the average person on how to prepare restaurant quality meals. Please Subscribe to this blog to enjoy some wonderful recipes and tips. Posted on March 4, 2013, in Wild Game and tagged braised, dinner, italian cuisine, orecchiette pasta, osso buco, rosemary, truffle oil, venison, venison osso buco, wild game. Bookmark the permalink. 5 Comments. Brilliant Justice. I am very hungry right now and could eat my computer screen. Have never eaten the shin part of a deer. This looks absolutely wonderful tho’ I know I shall not be able to access venison 😦 ! Looks about the same size as the veal shank pieces but much darker in colour! One of my very favourite ‘party offerings’ for decades and we do make it in a fairly similar manner 🙂 Off > the butcher’s methinks 😉 ! Ya done it (again) Justice! Thanks so much my friend!